UNCLE PETE PREPARES TO HUNT FOR EASTER EGGS – AND ALIENS! Grab your Easter basket and join UNCLE PETE in a special egg and alien hunt this Saturday in THE DARK VAULT OF PUBLIC DOMAIN. It’s the closest thing to an Easter Special we could come up with as UNCLE PETE brings you a bunch of egg-shell eyed aliens in Killers From Space! Before he undertook Impossible Missions, Peter Graves starred here as Dr. Douglas Martin (yeah, that’s right, Doc Martin), an atomic scientist who crashes in his plane while taking some readings around a recent atomic test site. He’s found wandering around soon after with no recollection of what happened and a mysterious scar on his chest. Under a dose of truth serum, he recollects being captured by aliens who plan to take over the Earth using huge bugs and lizards made with atomic energy gathered from the tests. There are gigantic crawly things and bug-eyed aliens a-plenty in this 1954 release (and 1956 re-release) directed by W. Lee Wilder and also starring Barbara Bester as Ellen Martin. 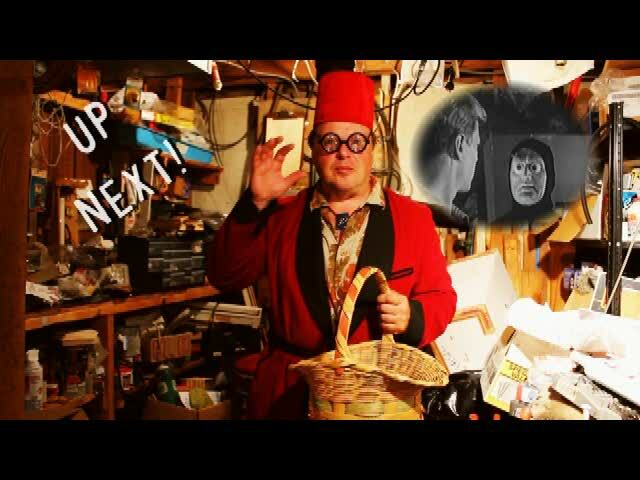 Meanwhile, back at the Vault, UNCLE PETE and El Vato discuss the rebuilding plans of the Dark Vault and bring you a short created by the Air Force right out of the wild Easter egg blue yonder called Wings for Roger Windstar. And then it’s out to the Dark Vault Transmitter storage-shack/woodshop/woodshed/smokehouse for a little woodcraft and power saw fun. Who knows what will emerge from that combination! ~ by UNCLE PETE on March 30, 2013.